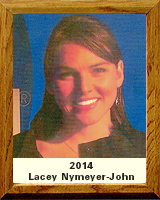 Lacey Nymeyer – John is homegrown from Tucson, AZ. A graduate of Mountain View High School, she opted to stay local and attended the University of Arizona from 2004-2009 where she excelled on the UA women’s swimming and diving team. Career highlights include being named the 2009 NCAA Women’s Athlete of the Year and winning a Silver Medal in the 400m Free Relay at the 2008 Summer Olympic Games in Beijing. During her career, Lacey also won five world championship medals, including gold at the 2007 World Championships and silver at the 2009 FINA World Championships as a member of Team USA. A two-time NCAA National Champion, Lacey has set American, NCAA, U.S. Open and World records and is a 26-time NCAA All-American. As a two-year UA team captain, she led the swim team to its first NCAA Championship team title. She also still holds UA records in the 100 and 200-yard freestyle. The UA awarded her the Ruby Award for top female student athlete in 2008 and the Pac-10 twice named her as “Swimmer of the Year” in 2007 and 2008. Since graduating from the UA in 2009 with a Bachelor of Science degree in education, Lacey continues to uphold her values for education, hard work and personal improvement. She is currently pursuing a master’s degree in higher education and loves working with students and faculty as the Outreach and Special Event coordinator for UA Campus Recreation. Since retiring from her swimming career, she was blessed to find a new love in her life and married Chandler John in April of 2010. Her husband played basketball for Eastern Arizona College and he transferred to the UA to pursue a degree in psychology with a minor in Business Administration. The couple now enjoys an active lifestyle away from the competitive world and love spending time with family and exploring the many outdoor activities Tucson has to offer. They recently expanded their family to include a new baby girl, born June 17, 2013.